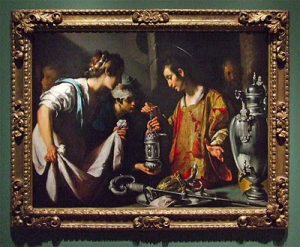 Saint Lawrence was born from a noble family from Aragon in Spain. His parents were very pious people who always embraced the Christian religion. His father and his mother Orentius Patientia, after the martyrdom of Lawrence have also been martyred like their son by the cruel Roman Emperor Lucinius Valeriano in Rome. Lawrence was born in 226 AD in Huesca, Aragón. It is said that when his mother was waiting for her son’s birth, she was surrounded with light. This mysterious light was interpreted as a sign that the baby inside her womb was to spread LIGHT to all those living in Paganism. It seemed so was because after few years, in the year 313 AD, the Emperor Constantine proclaimed Rome as a Christian Empire and totally eliminated Paganism. When Lawrence was still a child, he was given the sacraments of baptism, communion and Bishop Confirmation. He was one of the most important martyrs with a religious tribute and very strong tradition in the Universal Church history. Lorenzo grew up in Saragossa where he was very well educated and was considered a good example for other children. He was very smart and became one of the best students in school. Everyone believed that this child had something which felt very close to holiness. In fact, this led the local bishop to involve him and encourage him to become a priest. The life to priesthood grew further in Lawrence, especially when he met Sixtus. Sixtus, which was to become Pope, was a Greek philosopher and already archdeacon in Rome when he visited Spain because of work connected with the Church. He quickly became a great friend of Lawrence where he even invited him to join him on church work and take him to Rome. Here Lawrence had to leave his country to continue his studies and his duties as a priest and to work among Christians. Lawrence quickly accepted the offer of Sixtus. During their long journey to Rome they passed pagans in Genoa where they succeeded in converting much of the locals to Christianity and where there is also a myth that says that when Lawrence arrived in Rome, the pagan gods were shaken due to his enthusiasm. Besides the virtues which Lawrence possessed, he was also a man who loved peace and also worked as a sort of social worker. He was a dedicated man to the community at a time when it was treated very badly by noble and wealthy pagans. Lorenzo loved god so much, and in fact we find that this same love for God meant that he experienced the sufferings and martyrdom in a way considered one of the most severe and harsh martyrdoms throughout history. When the young Lawrence arrived in Rome he was welcomed by the Pope Fabian. Lawrence immediately began to work with the aim of helping Christians and teach the Gospels. At just 24 years of age he was already assisting the deacons of Rome. After Pope Fabian died the Roman throne was given to Pope Cornelius. This Pope appointed Lawrence as one of the deacons of Rome to continue spiritual work, and meanwhile had already become a Roman national. Lawrence helped greatly those who suffered, namely the poor, the sick and elderly and those who could not help themselves, especially in epidemics afflicting the City of Rome. Lawrence felt it was too much for them. When Sixtus was appointed as Pope Sixtus II in the year 257 AD, just one year before the martyrdom of Lawrence, the Pope appointed him as archdeacon of Rome. Now we find Lorenzo as vicar and church treasurer to further assist Pope Sixtus II. He was also in charge of the six deacons of Rome. They were named Agapitus, Felixissimus, Vincenzius, Gennarius, Magnus and Stephanus. In a short time he took the responsibility of many church activities and work, such as the management of church funds. He was also taking care of several martyrs sacred relics, especially those of St. Paul and St. Peter, the archives, sacred vestments and liturgical and various ceremonies performed by Pope Sixtus II. In 257 AD Emperor Lucinius Valeriano issued an edict to members of the Church condemning them to death. This edict was known as Episcopi, Presbiteri et Diaconi immenti menti animadvertantus. The church’s belongings, which at the time was very little, was confiscated, and any Christian worshipping and celebrations were prohibited. The Emperor also ordered harsh punishments for those who refused to obey this edditt. In these circumstances, Sixtus II ordered to locate the sacred objects including relics away from danger. It was actually due to this order that Sixtus II was arrested along with clergy during a sacred function held in catacombs. He was imprisoned and was brought before the senate where Valeriano condemned him to death without any mercy. 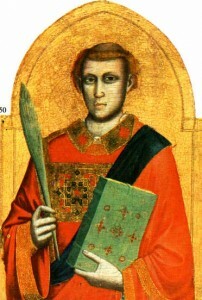 Sixtus II was beheaded in the temple of the Roman god Mars. While Sixtus was being escorted to jail after his arrest, he met with Lawrence at the edge of the road. Lawrence as he saw his friend being arrested he felt so sorry for him that he ran to him. Sixtus told him that they were going to meet in heaven in a short period of three days. He ordered Lawrence to distribute the treasures of the church to all those in need who live in Rome to help them in this time of need. Lawrence obeyed this mission given to him by the Pope, and he met with the poor, sick and elderly in the catacombs where he distributed the possessions of the Church of Rome, like gold items, silver and money. Lawrence healed many blind people, sick with plague and others through the sign of the cross. Thus the Church sings in the antiphon of this Qui per signum crucis caecos illuminavit. The Church also sing Levita Laurenzius bonus opus operatus est. During one of his last missions before being martyred, he went to the Neposian grotto where there were many hidden Christians due to persecution. He washed their feet as Christ did to the Apostles. He also encouraged them and gave many treasures and money to be able to buy clothes and food. 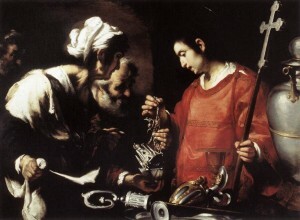 They understood that Lawrence was like Stephen, and in fact later these two saints were always painted together by many artists. Rome loved Lawrence so much so that he was declared its patron saint after Saint Paul and Saint Peter. Later he was considered the greatest saint to Rome. Unfortunately, those Christians who he went to visit all knew that this was their last encounter and the meeting that day was to be the last for them. Lawrence was said to possess the famous bowl, or kus, which according to legend was used by Christ at the Last Supper. This kus was among the treasures of the Church which Lawrence could not afford to give to the poor and sick. It is said that this Kus is today in Spain, in the Cathedral of Valencia in Aragon. Lawrence also asked God to destroy the statues of the pagan gods of the Roman Empire and legend has it that when Lawrence entered the temple part of the building of the temple was damaged and some idols fell and were shattered on the floor. This was a replica of what is likely to have occurred when the Apostle Paul entered the ancient temple of Diana. Some documents allege that Sixtus II and deacons were taken to the square before the temple where Lawrence informed the Pope that he had obeyed the last order he gave him, that he distributed the wealth of the church together with treasures. When the soldiers heard this they arrested Lawrence. 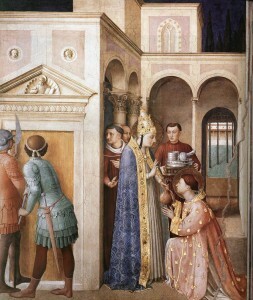 After cutting the heads of the six Deacons who were with Lawrence, soldiers caught him and brought him before the Prefect of Rome, and reported everything that was said between Lawrence and Sixtus about the treasures that were distributed to the Roman people and not given to the empire. 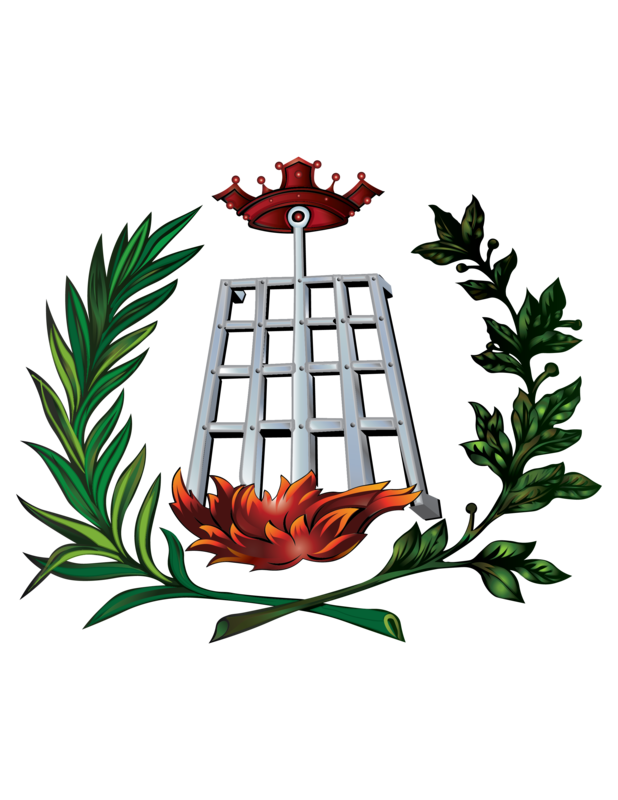 Lawrence was imprisoned in an underground cell in the custody of Hypolitus who was in charge of prisoners over there. In this prison Lawrence made several miracles which healed the sick and returned light to several blind. In prison he also met with Lucillus and after that he explained to him the principles of the mystery of faith, he baptised him and gave him back light with the usual sign of the cross. Hipollitus, the prison warden was fascinated and astonished by the miracles which Lawrence effected by Divine power to those in need, and found young teenage Lawrence very interesting. It was during this time that Hipollitus converted to Christianity and was also baptised by Lawrence. Faith filled the new firm believer Hipollitus, who found some serenity and also brought his family and other relatives to receive the Christian baptism by Lawrence. 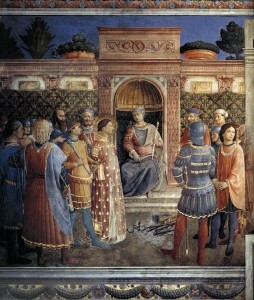 Cornelius, the prefect of Rome knew that Lorenzo was spreading Christianity in the prison where he was detained. He called Lawrence and said that he was aware of the treasures was the church. He said, “Bring them to us because the state needs them and Caesar is in coins, give to Caesar what is his”, and promised him that if he obeys this order he would be discharged. Lawrence did not believe him and so responded, “I give you the treasures that are so precious but I need three days to collect as much as I can”. The Prefect in stupid amazement at this generous offer which he never saw coming, never expected what Lawrence had in mind, so he believed what he said. The state of Rome was in a very bad shape and critically needed money because Rome had entered into war with Babylon, Persia, today’s Iraq. Meanwhile Lawrence was left in the care of the prison warden known as Perfectus, who was actually the converted Hipollitus, and the authorities did not yet know that he had been just converted by Lawrence. By transport provided by the same state and prefect, Perfectus (Hipollitus) accompanied Lawrence into those nasty dirty poor streets which were crowded with people. Lawrence gathered as much people as possible from these poor quarters, mainly the elderly, disabled, sick. Lawrence was well assisted by various other Christians and on the third day, Lawrence brought them all to the Emperor palace. He was beaten with hot metal bars that had protrusions on them to carve flesh away on every blow on his body. These bars were known as Skorpioni. This first torture took place in the Emperor’s palace. He was beaten using ropes with balls of lead tied to their ends. He was tied with iron chains, just one day before the final torture on 9 August when he was presented to Cornelius the Perfect Rome. It was ordered to lie on the Catasta. This was a Roman instrument of torture that seemed like iron bed. With this, the feet and hands of the victim have been tied and pulled, sometimes it would create strangulation. This torture took place in the palace of Tiberius before emperor Valerianus while he was seated on a throne where again ordered Lawrence give worship Giove, Roman Idol, but again Lawrence refused. Therefore, the emperor ordered that Lawrence be beaten again with wooden sticks. Cornelius ordered Lawrence to lie on the Catasta again to comb torture. This was a special iron instrument shaped like a large comb with sharp teeth abrading the skin of the victim. 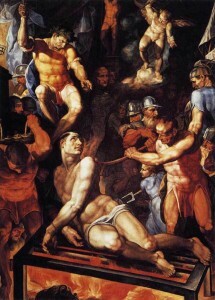 After these tortures Lawrence’s courage increased to confront more of Valerianus’s tortures, who ordered hot metal plates to be placed on the naked body of Lawrence. He was taken to another small room with a device that hangs torture victims from their hands. Here was the moment when Pagan soldier Romanus was converted by Lawrence and was later beheaded when this was discovered. Romanus was converted because he had seen the vision, a young angel wiping the blood and sweat from the body of Lawrence. Valerianus still insists and promised Lawrence to stop torture if (Lawrence) gives worship Pagan gods. But as we know Lawrence rejected strongly and remained strong in his faith. After this the Emperor ordered the soldiers to break Lawrence’s teeth with some rubble. The most brutal and deadly torture, Lawrence was bound by chains to an iron grill and roasted very slow until his soul emerged from his body. This martyr is one unique among all martyrdoms in history. Valerianus ordered the soldiers to bring large metal forks to overturn the body of the Saint from side to side, being turned by those forks undoubtedly increased the pain until he died. Lawrence died on the 10 August of the year 258. Prudentius wrote that his martyrdom served as a prelude to the end of Roman Paganism. Everyone was surprised and felt that Lawrence was a man of courage and heroism and hailed the young martyr. The serenity with which he went through the harshest of torments were the cause of many conversions since such harassment were considered the harshest in the history of pagan Rome, likely more severe after those Christ. Saint Augustine describes saint Lawrence as “A Patron of the Church and as a champion among Saints”.